Birch gets all funky…. for Purple Onion Designs (video). Today I’m cracking out the texture paste at Purple Onion Designs, and here I go ……colouring again, this time it’s with Prismacolor Pencils, doncha just love to colour and these sweet little Stacey Yacula images are perfect! I’ve linked the stamps below or you can head to Purple Onion Designs yourself, Michele has a new look shop, you really should head on over and take a peek! Other Supplies: Prismacolor Pencils – Cream, Peach, Putty Beige, French Grey 50, 70%. Light & Dark Umber, Goldenrod, Spanish Orange, Orange, Pale Vermilion, Process Red, Blush Pink, Pink. Cardstock – Grapefruit, Smoke. Palette Knife. < Previous Musing over a 21st birthday! Next > It’s a Good Day! That is so totally adorable Therese. I just love that bunny. Such a very sweet card..LOVE it!! Totally adorable creation! I always look forward to your videos but today’s creation is just extra, extra special! Please make more videos using the texture paste! Thanks for bringing such joy to the world of papercrafting! I can’t seem to comment on YT right now, but wanted to let you know this card is absolutely adorable, Therese! I love how you added dimension with the texture paste, and your scene is so cute! eeek, super fun! I love your embossing paste snow. your coloring is awesome as ever! So sweet!! LOVE how you used the texture paste! I’ve got to get some of that. I’m behind the times right now. LOL! Another cute bunny! TFS. Great job. SO CUTE! 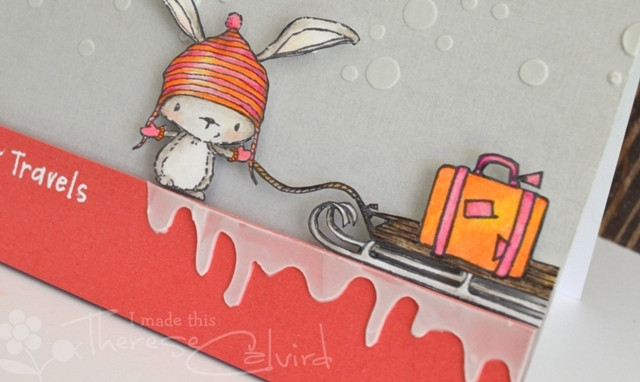 I love the sheer effect of the paste on the coloured card – so neat! Can you get any more creative. What an awesome idea to create your own mask to create the icicles. Very clever!